Titan Comics: PEANUTS Review | Warped Factor - Words in the Key of Geek. Tony’s up to his eyes in Peanuts. Happy days. Peanuts has been a fact of life for about three or four generations now (depending on how long a generation is judged to be). It started appearing in 1950, and this year, it’s about to get an updated feature-length movie. Not too shabby, 65 years into its life. Peanuts #1 is pretty much exactly what it says on the cover – it’s a reissue of the very first Peanuts strips ever published, between 1950-1952, in one collected volume. You’d have to be an entirely different kind of nuts to call yourself a Peanuts fan and not take the opportunity to get your hands on this. Yes, of course it’s a vaguely cynical marketing ploy to drum up interest in the upcoming movie. No, that doesn’t matter at all. 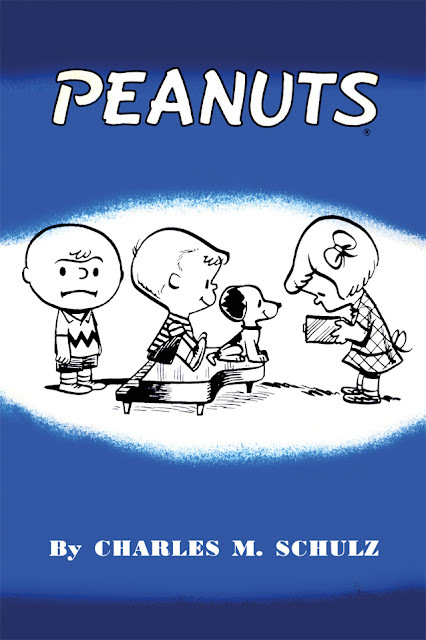 As it happens, Peanuts #1 is just the first in a whole deluge of Peanuts reprints from Titan Comics, currently flooding the market with interest ahead of the movie. You should see WarpedFactor Towers right now, we’re up to our waggling eyebrows in Peanuts, it’s like a geek comedy-writer’s masterclass. Because that’s what Peanuts is and always has been. It’s a gentle, wry look at the lives of grown-ups and the lives of kids all at once, the kids using often grown-up ideas, and logic that can only be childlike, to explore the baffling, contradictory world around them – the world in which, in the Fifties at least, a lot of American small town children actually seemed to live, but also the world at large in terms of the themes at play. At various points in its history, the comedy in Peanuts has seemed rather too gentle, coming as it does without rim shots or fanfares, without to a large extent the punchlines that marked out other comic strips (and later animated features) that were trying above all to be funny. Prepare yourself for a bit of a shock then, because in Peanuts #1, the gags hit home with a satisfying regularity. They’re not always complex gags, but they’re gags nonetheless, and themes develop over time. In this collection, you’ll find the strips that introduced some of what people think of as the ‘fundamentals’ of Peanuts. 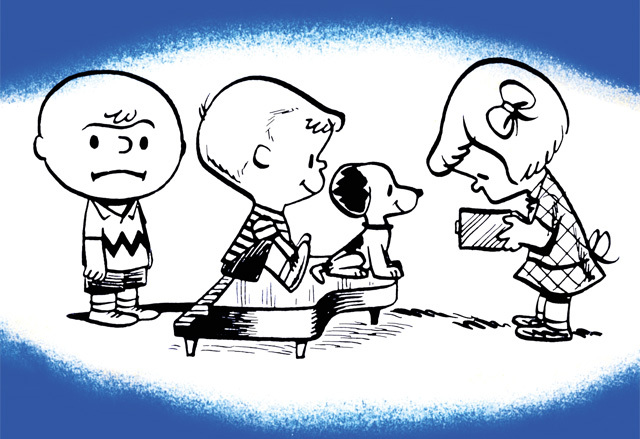 You’ll see Schroeder arrive in Charlie Brown’s world – as a baby. You’ll see him get his first piano, become a musical prodigy, and develop his moderately unhealthy obsession with Beethoven. You’ll see the building of Snoopy’s practically trademark kennel. And you’ll see the first failure-to-kick-the-football strip, a scene that has become a cultural icon in its own right. But you’ll also be fascinated by what’s not here. Woodstock, Snoopy’s bird friend – absent. Peppermint Patty is absent too, though there is a character called Patty, a more ‘traditionally’ Fifties girly girl than tomboy Peppermint Patty would ever be. Linus doesn’t exist here, though there is a friend of Charlie Brown named Shermy. And the girl who holds the football? Yyyeah, that would be Violet, as opposed to Lucy, as it was in later strips. Violet was a different character, though she looks and sounds very much like a proto-Lucy just waiting to happen. What’s more, while the essential Charlie Brown is here, he has rather more gumption than you might expect – getting his thrills and laughs by occasionally insulting Patty and running away. 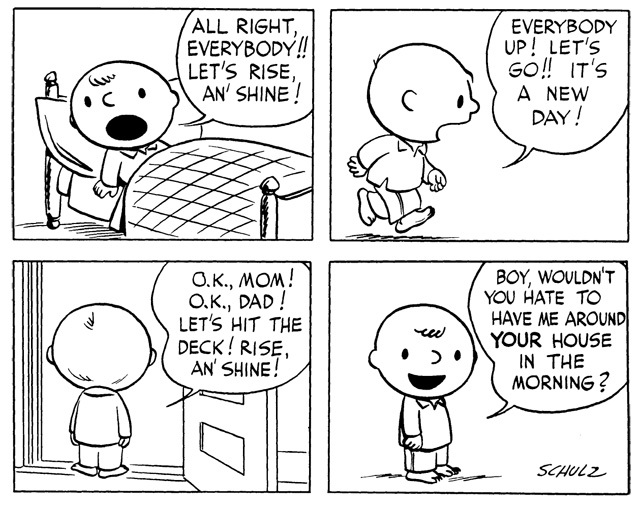 To be fair, Charles Shulz, the man behind the world of Peanuts, does give Patty her own way too, in strips that turn the tables on ‘Good Ol’ Charlie Brown.’ There are commentaries on male and female social roles, the fallacy of achievement, machismo, the myth of growing up and more in here, alongside simpler strips that deal with the madness that pets will put you through – Snoopy, for his part, does begin to develop some of his eventual character right here, being a shameless adoration-junkie and outdoing Charlie Brown in the popularity stakes at almost every turn. What you might find most surprising is the gulf between the artwork of Peanuts as you know it and the artwork of Peanuts here. While for the most part, Charlie Brown, Schroeder and Violet look the way they always will, there’s a degree of simplicity and crudeness to the artwork that speaks of its hand-drawn simple strip Fifties style. Meanwhile, Snoopy’s whole body shape is very much different. He looks more like a simple, notional ‘dog’ character here than the icon he would later become. If you’re any kind of Peanuts fan – and which of us isn’t, frankly, Peanuts has come to largely define at least certain times of year (if you don’t watch It’s The Great Pumpkin, Charlie Brown at Hallowe’en, I’m not sure we can be friends) – then you’re not going to want to miss the chance to get your hands on the reprints of these original Peanuts gems. It may not be exactly the Peanuts you know – rather it’s the germ of the idea that Peanuts would eventually become – but it’s still relevant and funny and one of life’s distinct pleasures. Don’t walk to your comic-book supplier of choice – run. Take your dog, you’ll look much cooler.